Stocks fell on Friday after the release of mixed employment data jolted interest rates higher. 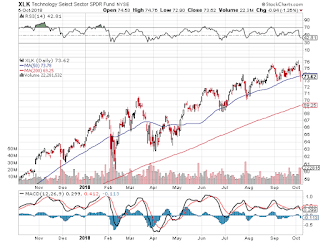 The S&P 500 closed 0.6 percent lower at 2,885.57 as the tech sector underperformed. The broad index also fell nearly 1 percent this week, posting its worst weekly performance since the week of Sept. 7. The Dow Jones Industrial Average dropped 180.43 points to 26,447.05 as Intel and Caterpillar lagged. It also notched its second straight weekly decline. The Nasdaq Composite pulled back 1.2 percent to 7,788.45 as Amazon, Apple, Netflix and Alphabet all traded lower. For the week, the tech-heavy index fell 3.2 percent, its biggest weekly drop since the week of March 23. It dropped 6.5 percent that week. At its lows of the day, the Dow fell as much as 325.67 points. The S&P 500 broke below its 50-day moving average for the first time since July 5 before snapping back above the closely watched technical level. The Nasdaq fell as much as 2.1 percent on Friday. The U.S. economy added 134,000 jobs in September, well below the expected gain of 185,000. However, the U.S. unemployment rate fell to its lowest level since 1969. Job gains for August also received a sharp upward revision to an addition of 270,000 jobs from 201,000. Wages, meanwhile, grew by 2.8 percent last month on a year-over-year basis to match expectations. "The labor market is going to keep getting tighter and that will mean higher wages," said Peter Cardillo, chief market economist at Spartan Capital Securities. "This is going to keep upward pressure on rates and continue to put downward pressure on stocks." The 10-year note yield rose to 3.24 percent and hit a fresh 2011 high while the two-year note yield advanced to 2.897 percent. The Cboe Volatility Index (VIX), widely considered the best fear gauge in the market, hit a high of 17.36, its highest level since July 2. The rise in yields pushed home-builder stocks lower. 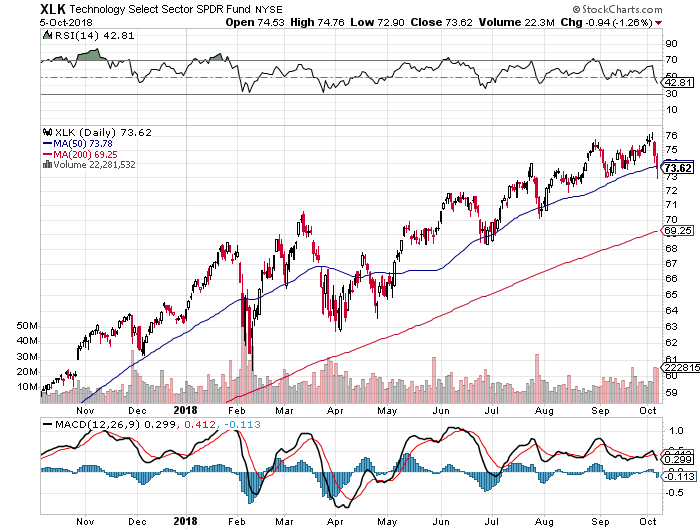 The SPDR S&P Homebuilders ETF (XHB) fell 0.8 percent and notched a 13-day losing streak. Emerging markets also fell as the iShares MSCI Emerging Markets ETF (EEM) slipped 0.4 percent. Emerging markets also fell 4.89 percent, their worst weekly performance since February. Yields have been on the rise this week amid strong economic data. The U.S. services sector grew at its fastest rate on record last month, according to data released by the Institute for Supply Management. Comments from Federal Reserve Chair Jerome Powell also pushed yields higher. Powell on Wednesday said that the Fed had a long way to go before interest rates would hit neutral, suggesting to markets that more hikes could be coming. "There is clear reason why this is happening," said Paula Solanes, senior portfolio manager at SVB Asset Management. "All of this goes very well with what the Fed is doing and what Fed Chair Powell said this week." Bank stocks briefly traded higher before falling with the rest of the market. J.P. Morgan Chase and Bank of America both fell around 1 percent, while Citigroup slipped more than half a percent. Banks typically benefit from higher rates as they make loans more profitable. JJ Kinahan, chief market strategist at TD Ameritrade, said investors are hesitant to buy into financials just yet because they've been "burned so many times in the past." He added financials are entering a "show me" period as rates rise. Other economic data released Friday include the U.S. trade deficit, which widened to $53.2 billion in August even amid an ongoing trade spat between the States and some of its key trade partners. Over the past 12 months, the deficit is up $31 billion or 8.6 percent. Friday's decline came a day after the Dow posted its worst day since Aug. 10. The S&P 500 and Nasdaq also fell sharply in Thursday's session. 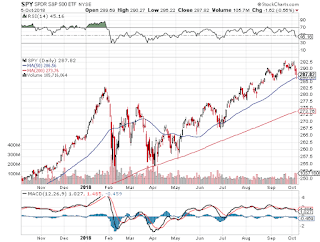 "The S&P 500 is topping out as policy normalizes. The Fed is already tighter than they realize," said Barry Bannister, head of institutional equity strategy at Stifel, in a note to clients. "As the dollar rises further and EPS estimates are cut the market will drop faster than the Fed can (or wishes to) react." He added investors should move toward more defensive sectors like consumer staples (XLP), health care (XLV) and utilities (XLU). Last week, I discussed whether investors are in the wrong trade, taking on a lot of risk in FANG and other momentum growth stocks and not taking account material downside risks in these markets which come with the lagged effects of Fed rate hikes. After writing that comment, Francois Trahan of Cornerstone Macro shared this with me in an email: "Growth is the first stage of Risk Off, then it's what I call stability and the final stage is defense where low vol would fit in. Low vol is what you emphasize when the markets are melting." Francois didn't specify whether he thought markets are about to melt down but it's clear that higher rates are starting to bite. However, in my last comment, I went over the global bond rout and stated that I believe the backup in yields is way overdone here and presents a good opportunity to load up on bonds as the US economy slows. We have spent the last few weeks on the road meeting with clients. Among key concerns is the level at which US 10-year bond yields should peak in this business cycle. The consensus among investors seems to be much above the 3.25% level that we are targeting. While there seems no doubt that the generational bull market in bonds is over, a key question mark is whether the bottoming process in bond yields will be “V” or “W” shaped. Our hunch is the latter, hence the formation of a horizontal band within which bond yields fluctuate for a few years. At 3.25%, bond yields are up 40% YoY and 44% above their 4-yma. As our Chart of the Week shows, this percentage change and deviation suggest the beginning of overshoot territory for US bond yields is above 3.25%. Also, given that our economic reflation index has entered the tightening zone this week due to the rise in oil prices, bond yields and the US$, the ongoing deceleration in US growth momentum is likely to anchor yields around 3.25%. 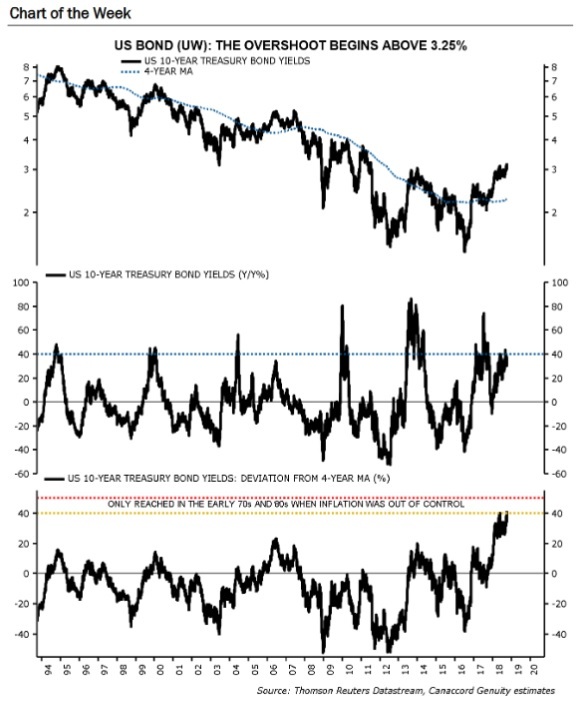 Last, the strong showing of US bond proxies today may indicate little upside in Treasury yields from here. If bond yields have peaked for now, does it mean it's also time to load up on stocks? No, it doesn't. As I stated in my last comment, there is a real risk the Fed will hike rates more than necessary (risk of a policy error) and investors need to pay close attention to emerging market stocks (EEM) and bonds (EMB), the US dollar (UUP) and US long bonds (TLT) here because if something blows up outside the US, all risk assets, especially high beta stocks, are going to get clobbered. This is why I've been warning my readers to get defensive and start focusing on mitigating downside risks here. Institutional investors can invest across public and private markets all over the world and invest in top hedge funds and private equity funds in hope of receiving absolute returns. Retail investors need to focus on investing in the right sectors and getting their asset mix right (stocks versus bonds) to protect against market shocks. So do institutions but they have more options than individual retail investors. The big question now is are markets going to melt down or just slumber lower for a while? Nobody knows the answer to this question. It's October, it's chilly, markets tend to go crazy during this month but sometimes they just keep climbing the wall of worry. I don't get caught up in daily or even weekly action, but my antennas are definitely up knowing full well that all those rate hikes are going to impact risk assets at one point, and not in a good way. Is this the start of something more vicious? It's too soon to tell. Funny things tend to happen in October but often times nothing happens so don't get too nervous just yet but pay attention to markets and what's going on outside the United States. 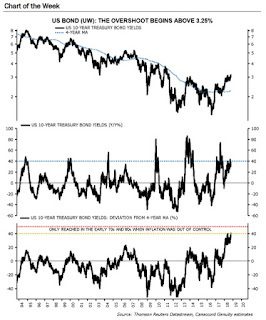 Below, what do rising Treasury yields mean for the market? Matt Maley of Miller Tabak and Mark Tepper of Strategic Wealth Partners discuss with Mike Santoli. 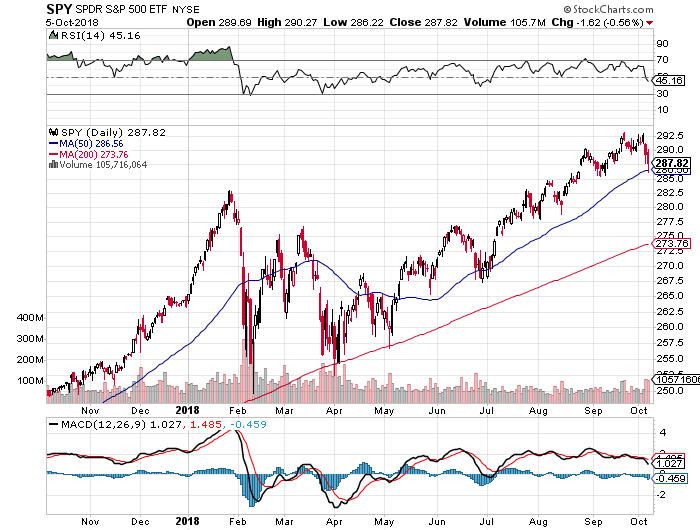 And traders Jim Lebenthal and Josh Brown are joined by Brenda Vingiello, CIO of Sand Hill Global Advisors, and Rob Sechan, managing director at UBS Private Wealth Management, to discuss whether stocks will continue to drop if interest rates keep rising. Third, Wall Street veteran Edward Yardeni doesn't expect the uptick in geopolitical concerns will ravage the stock market this year — even though President Donald Trump may not be making it easy to see that right now. Yardeni wrote an interesting blog comment on China's Syndromes which you should all read and even though I'm not as bullish as he is, I still read his comments and listen to his insights. Lastly, Marko Kolanovic, global head of macro quantitative and derivatives research at JPMorgan, and Dubravko Lakos-Bujas, chief U.S. equity strategist at JPMorgan, explain why the firm is turning to emerging markets as they expect U.S. and emerging markets to converge in 2019. They speak with Bloomberg's Jonathan Ferro on "Bloomberg Markets: The Open." Interesting discussion, it's a contrarian call but I was expecting a bounce in emerging market stocks this summer which hasn't materialized yet. Nonetheless, I remain short emerging markets and wouldn't play them on the long side except for a brief trade. That's it from me, enjoy your Canadian Thanksgiving weekend and Columbus Day in the US on Monday, I will be back on Tuesday.